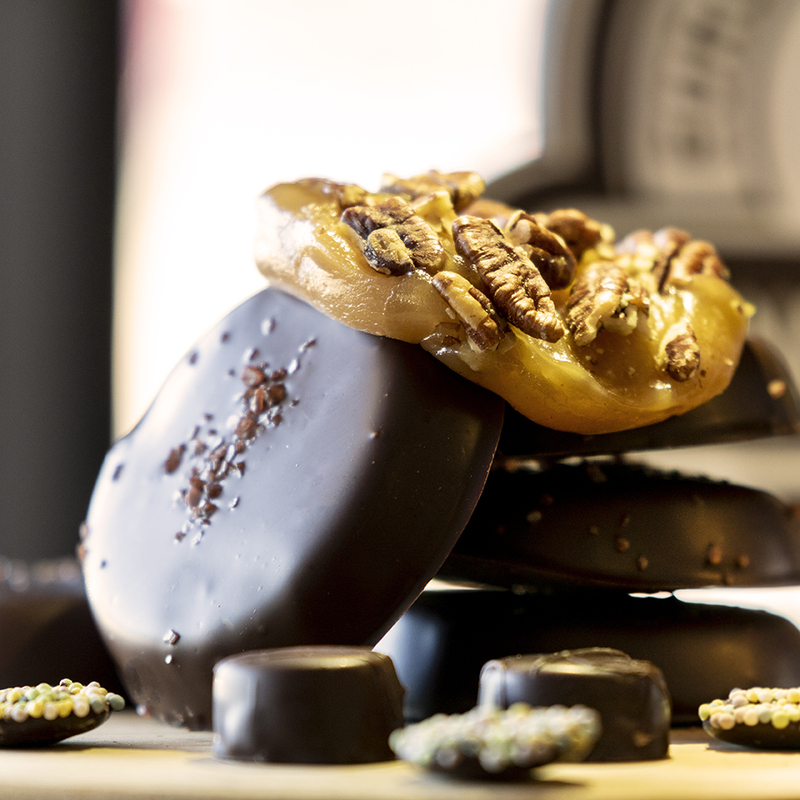 Chocolate tradition meets modern health at our award-winning chocolate shop. We offer a decadent and unique collection of handcrafted organic European dark chocolates available for delivery nationwide, as well as desserts, vegan soft serve, non-dairy artisan cheeze, and homemade frozen meals and pizzas for local shoppers. Our Manchester shop is open Tuesday through Saturday 10 to 7, Sunday and Monday 11 to 6. AVAILABLE BY SPECIAL ORDER ONLY! CLICK HERE TO VIEW THE EXCLUSIVE SELECTIONS NOT FOUND ONLINE! Call 860-643-2552 to order. Pick up in-store or have it shipped anywhere in the US! For a decadent gift they will treasure, choose a Divine Treasures chocolate assortment! All are made with vegan, gluten-free, organic European dark chocolate. Truffles, caramels, animal shapes—you’re bound to find the perfect box for them! Our original caramel recipe is crafted in-store with no dairy, no refined sugar, and no gluten, yet there is a distinct buttery-sweet taste and a classic silky-smooth texture. It makes a perfect filling for our chocolates. You have to taste it to believe it! We use responsibly-sourced organic dark chocolate to enrobe every delicious slice of filling and to mold every signature truffle shell. Genuine, quality cacao flavor is the at the essence of every piece. Discover your favorite today! Already know what you want? Let's get you there quickly! Through tradition and dedication, owner and chocolatier Diane Wagemann creates chocolates with a homemade flair and a genuine commitment to quality. Our chocolate is sourced from organic, socially-responsible cacao, then crafted in the gourmet European fashion with our own perfected recipes. Creamy, crunchy, gooey, or even spicy—there is a delicious surprise for every palette! And we offer decadence with health in mind, as we design our chocolates to be gluten-free, vegan, non-dairy, and perfectly sweetened with wholesome, unrefined sweeteners. 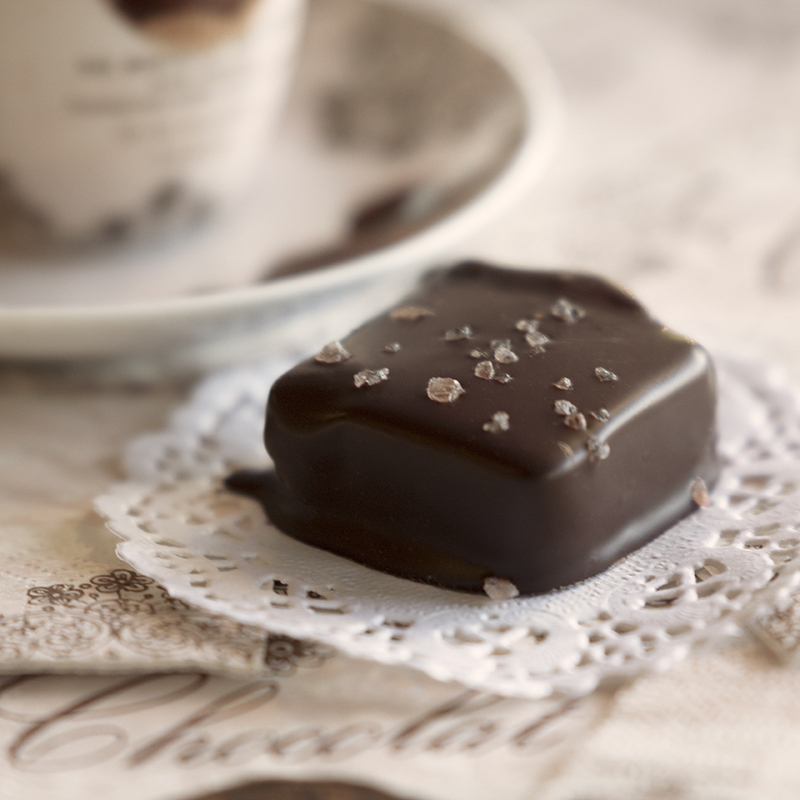 Browse the chocolate cases at our main shop in Manchester, CT, or sample our collections in stores across the region. You can also explore our collections online and have orders shipped directly to your door, or have them ready to pick up at our store! Though we offer an extensive collection of chocolate treats online, don't forget to visit our store in Manchester, CT to enjoy our bestselling, ever-expanding selection of vegan and gluten-free sweets and savory eats! With an impossibly creamy texture and taste, our homemade soft-serve "ice cream" is completely gluten-free, non-dairy, and vegan. Treat yourself to an indulgent sundae! Cozy spice cakes, caramel-topped brownies, classic chocolate chip cookies, homemade apple pies with flaky crusts ... and the list goes on! Gluten-free, non-dairy and vegan dessert decadence without gluten, dairy, or refined sugar! We craft nut-based, vegan "cheeze" products to mimic mozzarella, cheddar, parmesan, and more! And don't forget the gluten-free pizzas, soups and specialty dinner items and meals, like homemade lasagna!